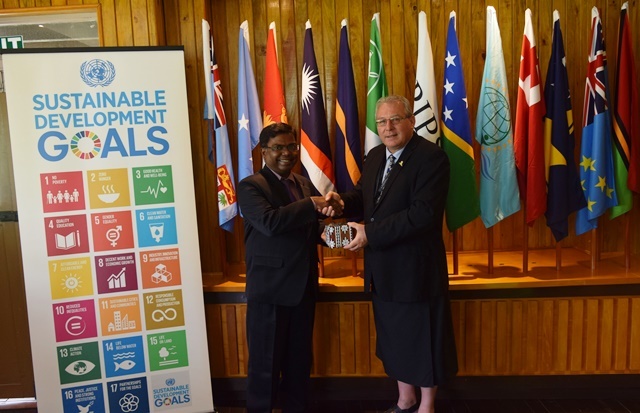 The Indian High Commissioner to Fiji, HE Mr Vishvas Sapka commended PIDF by recognizing its inclusive multi-stakeholder approach in discussing Pacific concerns during a courtesy visit to the Secretariat. 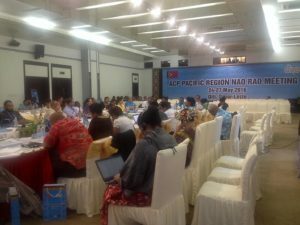 HE Sapka acknowledged the achievement of the Forum over their relatively short year of operationalization. PIDF Secretary General, François Martel provided an overview of recent achievements and on areas of focus for the Forum to the visiting commissioner. Discussions centered on a partnership with The Energy and Resources Institute (TERI) for an upcoming Sustainable Development Summit for the Pacific Islands to be held in Suva tentatively in May 2017. An acknowledgment was expressed by the Secretary General to HE Sapka for diplomatic support provided by the Government of India for the application of a UN Observer Status which was successfully given to PIDF in December 2016. The visiting High Commissioner was also informed of the PIDF Leaders’ Summit and Conference along with a Pacific Blue Economy Conference to be held in Honiara, Solomon Islands in August, 2017. A consensus of the meeting was that there were areas in which there could be mutual collaboration for efforts towards sustainable development capacity projects.